I got an e-mail from a buddy named Shannon, who's a heck of a lady, and who's associated with the "House of Sharing" home for comfort women. 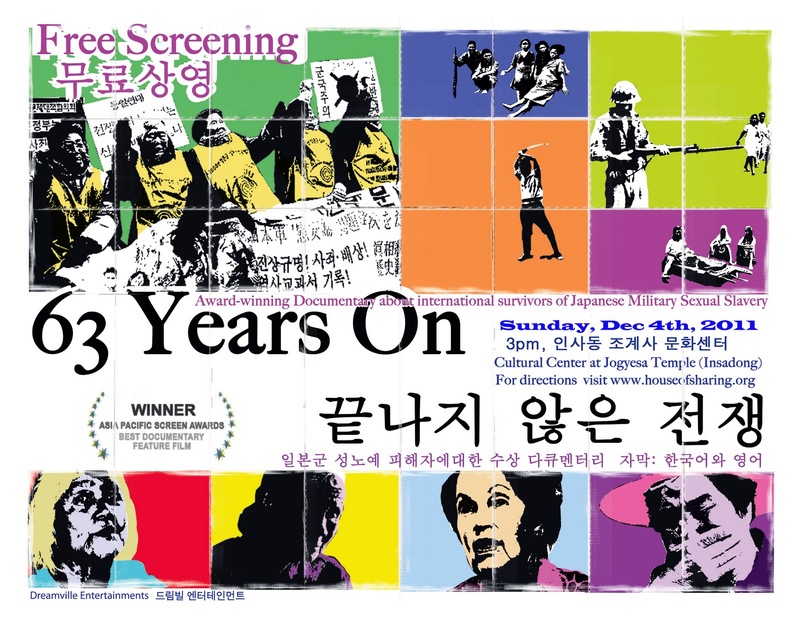 On Sunday, December 4, from 2-4pm in the theatre of Jogye Temple, one street over from Insadong, there's going to be a screening of a documentary film about the lives of these women, which I think you should go and see. 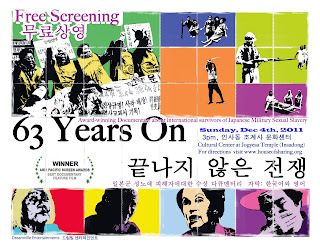 The documentary film “63 Years On” will be shown at a free screening at Jogyesa Temple Theatre on Sunday, December 4th 2011. This is an opportunity for both the Korean and International communities to further engage with the ‘Comfort women’ issue and to support the continuing fight for justice. A brief Question & Answer session will take place after the film, an opportunity for those who wish to share their thoughts on the film and ask any questions to members of the House of Sharing’s International Outreach Team. In this film, award-winning Korean director Kim Dong Won presents the harrowing experiences of 5 international survivors of Japanese Military Sexual Slavery during World War II. The very personal telling of their experiences is supported by excellent research and archival footage to create a powerfully honest, determined, and often heartbreaking documentary. While this gripping film may evoke great sadness and anger, the bravery displayed will truly inspire all who see it. The House of Sharing’s International Outreach Team works to raise awareness of the issue of Japanese military sexual slavery during World War II and to support the survivors, called Halmoni, in their on-going struggle for historical reconciliation and justice. The team is composed of both foreign and local volunteers who lead English tours to the House of Sharing and the onsite Museum of Sexual Slavery by the Japanese Military. The House of Sharing’s International Outreach Team also works to highlight continuing crimes against humanity, including the form of sexual violence during war and international sexual trafficking, that women and children across the world continue to experience on a daily basis. This screening provides a window to an episode of Asian and International history which has been willfully ignored by so many for more than 63 years. You are invited to join the House of Sharing and show your support to the survivors who continue the fight for justice.